In the summer of 2012, while a graduate student in art history specializing in American and Native American art at the University of Michigan, I spent three months as a curatorial intern at the Thomas Jefferson Foundation, the organization that oversees Monticello, the former home of Thomas Jefferson in central Virginia. While the staff at Monticello spent much of the previous decade reconstructing slave histories and physical spaces on the site, little had been done with its Native histories since curator Elizabeth Chew had reinstalled the Indian Hall for the National Lewis and Clark Bicentennial.1 As conceived by Jefferson, the Entrance Hall to Monticello had served as a kind of museum, containing maps, natural history specimens, European paintings and sculptures, and Native-made objects. Many of these latter objects had been sent eastward by Lewis and Clark in the early stages of their expedition, prompting the staff of Monticello to remount the hall and its Native collections for the 2002 Bicentennial. In 2012, I was hired because of my expertise and assigned the task of reexamining these collections with an eye toward expanding their presence within the overall narrative of Monticello. Figure 1. 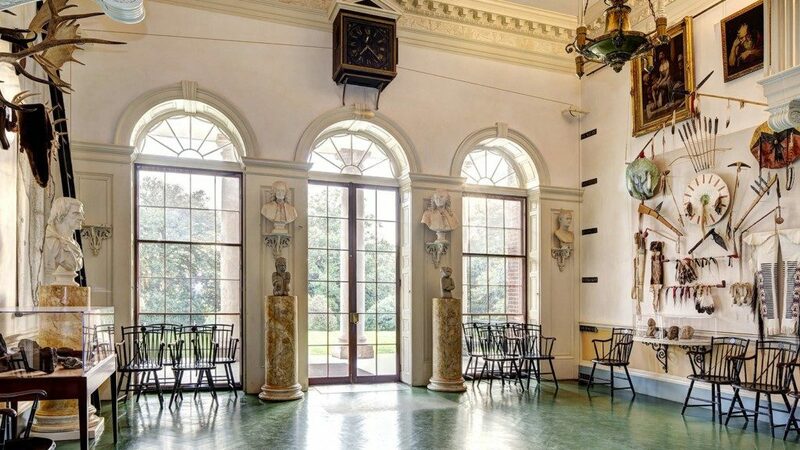 The Entrance Hall, Monticello, as reinstalled in 2002 ©Thomas Jefferson Foundation at Monticello. Figure 2. Anonymous carver, Late Mississippian tradition, heads from a Middle Cumberland shrine pair of figures, female (left) and male (right), c. 1250–1350 CE. Found near Palmyra, Tennessee. Soapstone talc with various pigments, (L) 10 1/2 x 8 1/2 x 6 in and (R) 11 x 8 1/2 x 6 1/2 in. (L) Thomas Jefferson Foundation Purchase, 2014 and (R) loaned by the National Museum of Natural History, Smithsonian Institution ©Thomas Jefferson Foundation at Monticello. 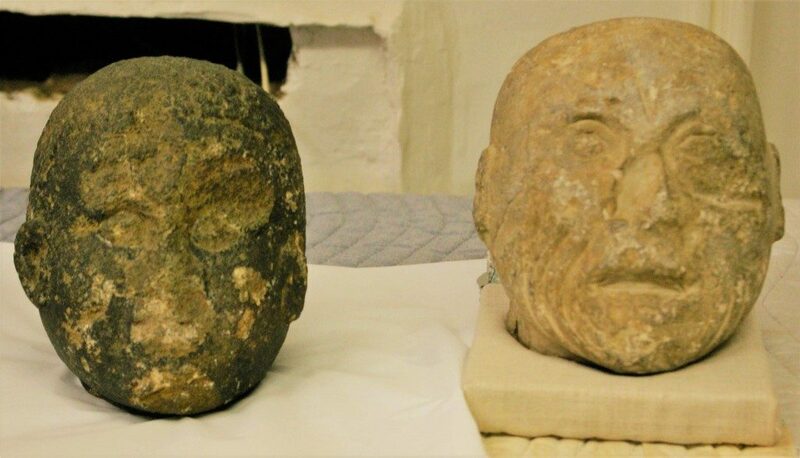 It came as quite a surprise, then, that during my internship I reidentified two stone heads that today sit in the hall display cases and are what remain of Jefferson’s original statues (fig. 2; seen at the far right of fig. 1).5 The two heads are nearly identical in height (10 3/4 in.) and close in weight (12 to 14 lbs.) and are made of a similar soapstone. They share incised eyes, carved ears, an angled neckline, a flattened back, and a single carved brow bone. The heads have sustained a high degree of damage, displaying major gashes and breakage with evidence of later re-carving and incising. The male head includes rough-hewn holes containing plaster in the back and base of the neck, while the mouth and nose of the female head are mutilated beyond recognition. A coat of black pigment has been applied to the female head, which, where worn thin, reveals flakes of red beneath. Figure 3. 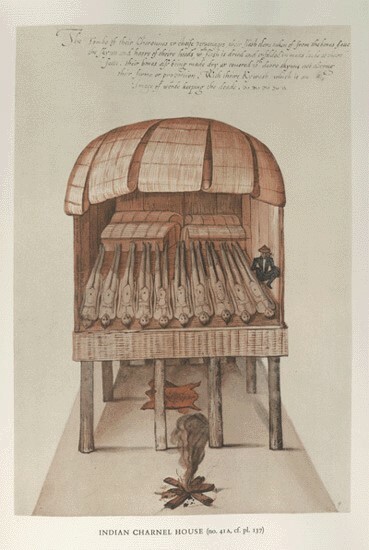 John White, An Ossuary Temple, c. 1585–93. Watercolor over graphite, touched with gold, 11 5/8 x 8 in. British Museum, London. I was able to identify the heads as resembling Mississippian Culture (800–1600 ce) funerary pairs.6 The male head is identified by deeply grooved parallel lines on either side of the mouth, representing either tattoos or wrinkles.7 Their full bodies would have displayed different poses, with the female kneeling (sometimes with a delineated skirt line around her legs) and the male in a cross-legged posture.8 Early explorers described such pairs, visible in riverside or mound temples as the expeditions crossed the landscape. In the 1525 chronicle of a kidnapped Catawba man baptized by the Spanish as “Francisco de Chicora,” de Chicora narrated the Spanish exploration of a North American “palace” in whose courtyard they “found two idols as large as a three-year-old, one male and one female.”9 Pairs are presumed to represent married couples, but such figures also appeared alone. A visual depiction of one such sanctuary figure appears in a late sixteenth-century watercolor by John White (fig. 3). The sketch shows a Roanoac ossuary temple in North Carolina, with a cross-legged male figure of wood seated to the right of a row of desiccated funerary bodies. Wood may have been the most common medium for such figures, which may partially explain why so few of these figures and pairs have survived to the present day (fig. 4). As it turns out, the Monticello heads belong to a very specific region and subtype of Mississippian figures. They were dug up on the western periphery of the Nashville Basin at what is known as the Murphy Farm site—identified as “Palmyra, on the Tennissee,” in the 1809 to 1815 Monticello inventory cited above. In this region, Native-made mounds were built singly and were relatively evenly spaced, suggesting small village patterns. 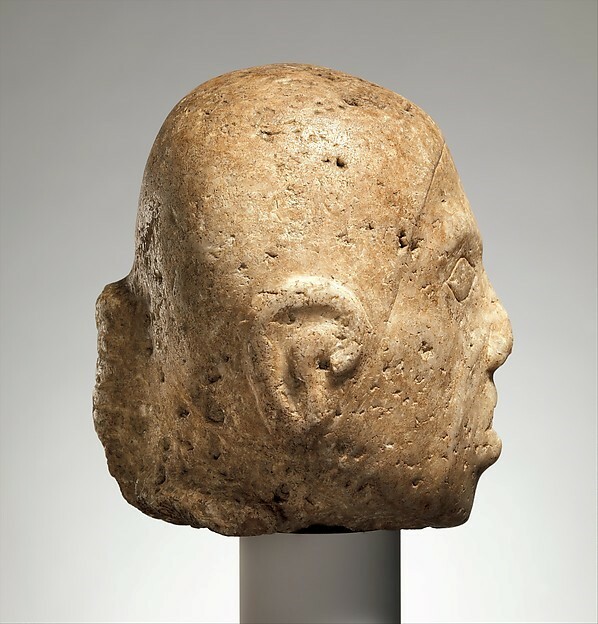 A fully intact head at The Metropolitan Museum of Art comes from this same region and exhibits many of the same traits as the Monticello heads: incised eyes and a single softened brow line, visible hairline, ears carved in relief with inner compartments, elongation at the top of the head, a fairly flat back, open mouth, and an upward gaze (fig. 5). It is thought that the open mouths released the represented ancestor’s breath into the world, acting as an in-between location or kind of access portal between the living and the dead.10 The extraordinarily similar size of all three heads, along with the matching angles and incised eyes, suggest that the carvers adhered to a strict regional standard in size, technique, and style, or, more provocatively, that all three heads may have been made by the same hand or workshop. Figure 4. 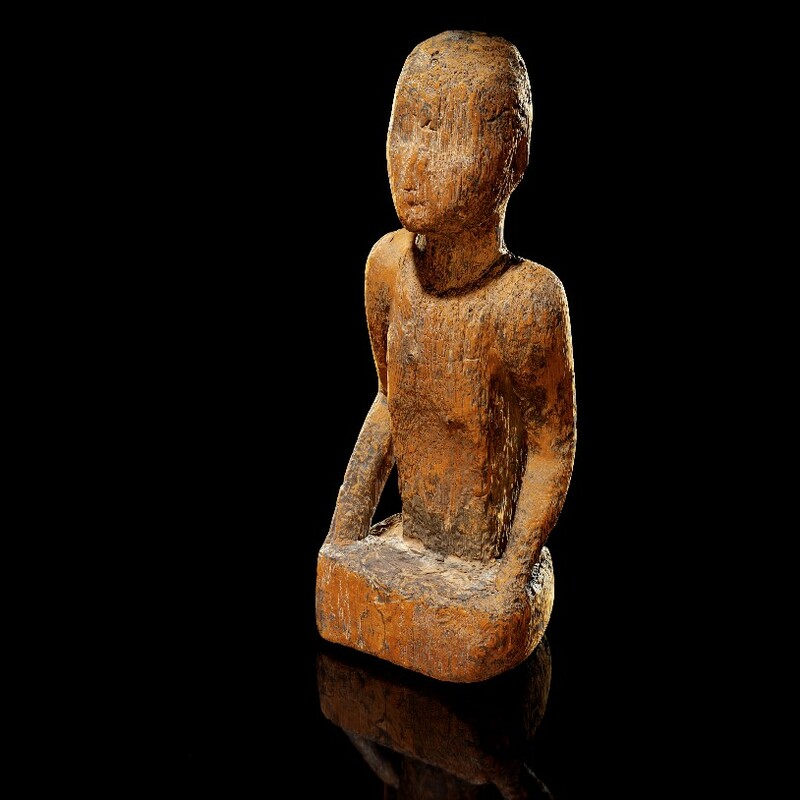 Anonymous carver, Late Mississippian tradition, human figure, 1200–1500 CE. Found in a cave near Pineville, Kentucky. Wood and pigments, 26 in high. National Museum of the American Indian, Smithsonian Institution, Washington DC (04/8069). Photo by NMAI Photo Services. Figure 5. Anonymous carver, Late Mississippian tradition, head from a Middle Cumberland shrine figure, male, 1200–1300 CE. Found in Tennessee. Marble, 7 1/2 x 5 1/2 x 6 in. The Metropolitan Museum of Art, New York. 2. To obtain accurate plans, drawings and descriptions of whatever is interesting, (where the originals cannot be had) and especially of ancient Fortifications, Tumuli, and other Indian works of art: ascertaining the materials composing them, their contents, the purposes for which they were probably designed, &c.
It is entirely plausible that the Tennessee farmer’s offer of the statuary pair to Jefferson was in response to this call from the APS. The signatories of the APS call were largely of a generation that had grown up with regular Native delegation visits passing through their neighborhoods and sometimes lodging in their homes.18 As a young lawyer, Jefferson had worked multiple cases of Native Americans suing for their freedom; as statesman Jefferson hosted delegations and attended Cherokee a ne jo di (stickball) matches; and throughout his lifetime, he purchased moccasins and other Native-made objects.19 He, and others in his circle, translated these many experiences into the (re)presentation of Native peoples, both past and present, in their various projects, many of which had nationalist overtones. The APS call was only one of a host of projects that reflected and addressed Native presence in the Americas, both historical and contemporary. Besides the Lewis and Clark expedition and the hall at Monticello, Jefferson’s own projects included America’s first mound dig, his Notes on the State of Virginia (1785), and the collection of Native vocabularies.20 He also obtained several important early accounts of American exploration for his library, which he often pulled out for his visitors.21 One volume included a print version of a John White watercolor of the Roanoac ossuary temple (fig. 3), by which Jefferson may have connected his soapstone figures and the earlier inhabitants of the region. These books were used to educate Meriwether Lewis on Native cultures before he and Clark headed West, thereby shaping their own approach to Native peoples. We have grown so accustomed to difference as the definer between historical Native and European art that such claims of historical continuance with Ceracchi’s bust—as well as with the European art and American politics represented by its described display—seem preposterous. To Jefferson, however, Native arts, architectures, histories, politics, and languages were the foundations on which a distinct America would rest. His representation of Native peoples in the Indian Hall certainly imposed non-Native ideologies such as art and progress onto its subjects and objects, as seen in Wirt’s description. But it is important to recognize the visibility of Native histories and cultures within early American public discourse, symbolized by Jefferson’s placement of these figures in the White House and the hall at Monticello. This visibility and presence seems to have had little traction with the next generations. An 1826 letter from Jefferson’s granddaughter, Ellen W. Randolph, to her mother Martha (Jefferson’s daughter) discusses at great length the public disagreements between two supposed experts on Native life and cultures.24 Ellen expresses extreme distress that, so removed now from first-hand knowledge of Native peoples, she has no means by which to determine the truth of the experts’ competing claims. Several years earlier, Martha, who largely ran the day-to-day operations of Monticello, had ordered the points replaced on Jefferson’s Native-made arrows with “African” ones crafted by Monticello slaves, as if there were no material differences between the two.25 After Jefferson’s death, the president’s children and grandchildren sold off or gave away most of Monticello’s Native-made objects, and their failure to record these transactions in any surviving records suggests that a low value was attributed to these items. As a consequence, we have no record detailing how the two stone heads left Monticello. The image of rare Native-made objects being “kicked about” Carrsbrook’s expansive yard vividly illustrates the destruction of Native cultural heritage that accompanied Manifest Destiny in the United States. Such destruction was possible when cultural amnesia held sway over the American imagination, creating the historical absence of Native peoples that was promoted by nineteenth-century American colonial processes—the rewriting of history described by scholar Jean O’Brien, whereby nineteenth-century Americans of European descent recast the histories of their towns and regions solely in Anglo terms.30 We continue to work under these whitewashed histories, as the stone heads’ inherited misattributions remind us. These objects provide an opportunity, however small, to re-articulate the presence and cultures of Native peoples in early America. I owe a note of thanks to Stephanie Barron, Janet Berlo, Diane Ehrenpreis, Kevin Murphy, and Sally Webster for their comments on drafts of this article; to Elizabeth Chew who was an advocate for my internship and this research; and to the University of Michigan Museum Studies Program, as well as alumnus John Dryfhout, for the funding that made this internship and research possible. I follow Native Studies in my terminology. In this essay, writing from the United States, I refer to indigenous peoples of North America as Native Americans. I use the qualifier “Native” as the adjectival form. Because Native histories predate current nation-states, and various groups existed on both sides of what are now the U.S.-Canada and U.S.-Mexico borders, I use these terms inclusive of the North American continent. About the Author(s): Kristine Ronan is an independent scholar specializing in Native American and American art of the 19th and 20th centuries.